Being half Sri Lankan means that I don’t usually eat Indian food while I am out as I tend to cook a lot of curries at home, so given the chance I usually tend to eat something different. However, my usual eating buddies wanted to check this Indian place out, and so we went! Now, I have been to Dishoom once before for breakfast many moons ago but all I had was a naan wrap so this time around I wanted to see what this place was all about. First of all is the decor; we went to the King’s Cross branch which was HUGE. 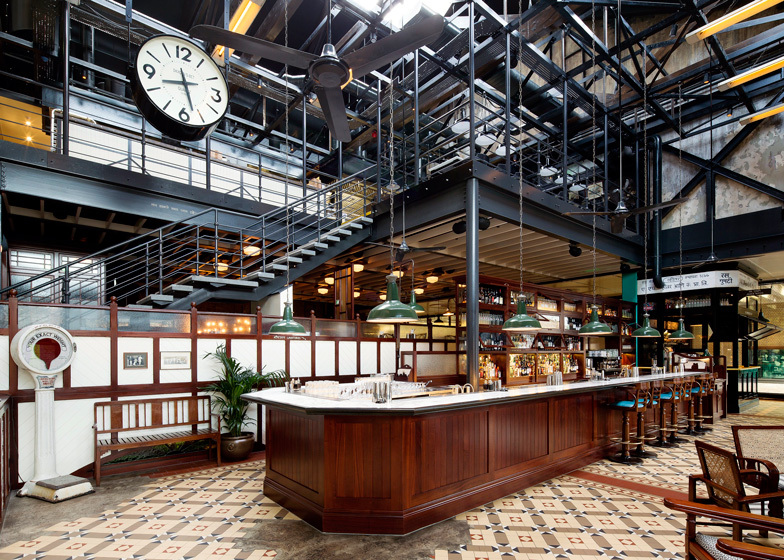 It is set in a Victorian industrial warehouse and the space is decorated with rustic dark woods and Victorian food equipment such as large scales and potato sacks. The space feels warming and welcoming. We have booked a table at 1pm but even then we had to wait around 15min as the place was filled with people, so a reservation is heavily advised. The food is Indian with a twist. It has a huge selection of chai teas, and the menu emphasises the importance of spices, so expect a lot of cumin, fennel and paprika. Their naan wraps seem to be their ‘special dish’ as every other table was enjoying them. We opt instead to share a bowl of fried calamari as a starter which came at a minute’s notice and it was flawless. Crispy, but moist with a spicy kick at the end. We devour the bowl in a couple of minutes. For mains, I had the Masala Prawns which were the best masala prawns I have had in a very long time. I also had the tikka panner which came with grilled peppers and a bowl of jasmine rice. My friends had the biryani and the prawn and pomelo salad. The biryani came with a lovely yogurt and tomato dip which we all shared as well. For dessert, we had two portions of their chocolate pudding, one with chilli ice cream which did have a real kick at the end, and another with the nicest cinnamon ice cream I have ever had. By the end of the meal I was so fulled I need two cups of mint tea and a good hour to allow my body to digest all that deliciousness. Honestly, I was in a food coma, and it was a joy to finally have found a really good Indian in such an amazing location. The bill came at £100 which is £30 per head, so it is also quite affordable! I am already thinking of my next visit, as the menu is so extensive it would be rude not to go back!! !